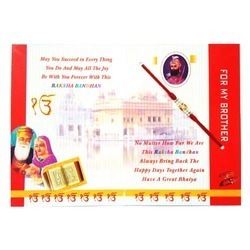 The Rakhi Greeting Cards we offer are created by innovative designers, who have sound knowledge of the latest business sector patterns. 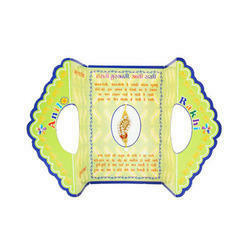 These specially designed rakhi cards are provided by us in differed outlines, designs and patterns which match the auspicious occasion of rakhi. Leveraging by the vast experience of this domain, we offer the optimum quality of Handmade Greeting Cards. Their elegant design, distinctive appearance and vibrant color combination, make these handmade greeting cards extremely demanded. Rendered by us at cost effective prices, the offered handmade greeting cards are extremely appreciated among our clients. Looking for Greeting Card ?